We are proud of our world standard facilities and visitors from all over the world are suitably impressed. Each of our four production facilities is renowned for being spacious, open, light and airy and we pride ourselves on the overall cleanliness of each factory. Our showroom at the front of each complex displays an array of our product lines. 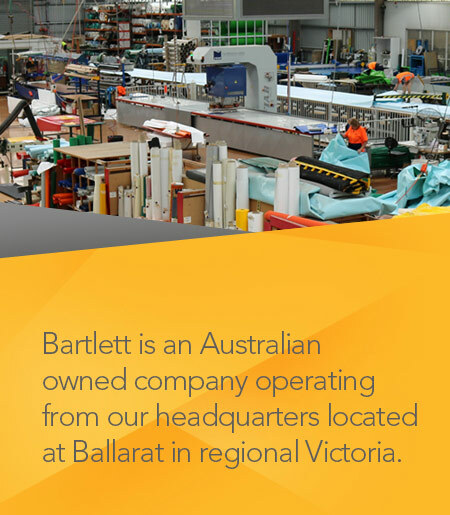 Each factory houses the latest in technology with an ever increasing range of ‘state of the art’ equipment and purpose built process machinery. The unique design of the factories supports enormous versatility and volume with products manufactured from a number of specialist production sections. Our production flexibility can cater for mass runs or a one-off product in either standard production or made to order custom products. Typically a production run for large covers could total 3000 units, totalling two million square metres of fabric; or we can produce a single item using less than a metre of fabric – the possibilities are seemingly endless. There are no limits; we are confident that our continued growth is assured through the combination of process and equipment development and our commitment to the highest standards of quality and service. Our success comes from our people. We work together in a fair, safe and secure environment. We will provide the opportunities that challenge and reward our people to grow and develop their skills. Respect and trust is the foundation of our relationship. Customers are our partners our Number One Priority. Our products provide value for money; we aim to be our customers’ first choice. By providing high quality service and solutions we will meet our customers’ needs and exceed their expectations. We are committed to mutually beneficial relationships with our suppliers by developing strategic alliances. We will achieve this by treating our suppliers in a loyal and ethical manner, being open in our communication. We understand that our success comes from the commitment and responsibility of our shareholders. Through our loyalty we commit to meet the shareholders intent. We will be a responsible industry leader whose success will be achieved through innovation and adaptation. By being approachable, supportive and respected; our name will be our benchmark. We accept responsibility for our role in providing a healthy and sustainable environment for the communities in which we operate. Our reputation as a responsible and supportive company will be exemplified through the continuing community involvement of our company and staff. Our company will be a family owned professional corporate umbrella organisation that grows and develops profitable strategic business units. We will use and expand on our fabrication ingenuity and expertise to become innovative industry leaders in existing and emerging markets by producing and selling appropriate products.